We humans are a very visual bunch. We like to see things in action, we like to bear witness to events, and we love it when a concept we have heard about suddenly develops before our very eyes. So how can this be tapped into? How can we add these vital elements to our data visualizations to create something that makes the viewer say simply… ‘wow’? These are the techniques you should be using in your visualization strategies; this is how to raise your visual game and really impress your content users. What does a good story need? What do all great narratives share? They all have characters, a setting, a timeline and an ultimate aim. In the case of a great visualization, the characters are the data itself, the setting is the contextual information presented along with the data, and the ultimate aim is to illustrate key points and outcomes to the content user. But there is something missing here… the timeline. If your data has a time element, or is time critical, this needs to be illustrated in your visualization. Effective visualization is about selecting the right metrics and creating the right framework within which to display the narrative. Progression and development over time gives you the opportunity to do just this. Let’s imagine you want to demonstrate the worth of your business’s customer relationship management software to potential clients. You create a visual examining the progression a customer makes throughout their lifecycle, highlighting customers and leads lost at each point. Then you move to another visual, highlighting the progression over time after your CRM software is deployed. The real time development of the data is underscored, emphasized for all to see. This is the power of data visualization. This technique provides content users with the codes they need to unlock the data before them, exploring its meaning and insight and witnessing its development over time. When we want to present visualizations of data pertaining to specific geographic locations, what is the go-to technique? A map overlay of course. Just as maps have an innate ability to show us where we are when we are feeling a little lost, data visualizations overlaid on top of a map can help us connect specific data values to certain locations. But the power of a map overlay goes beyond this. Remember; this is your data and visualization, the narrative you explore with your visuals is up to you. Provided the data is accurate and clearly presented, the traditional form of the map can be subverted. For example, if you wish to present software take-up levels on a state-by-state basis, a simple chloropleth map with different states shaded in different colors according to their adoption rates could suffice. 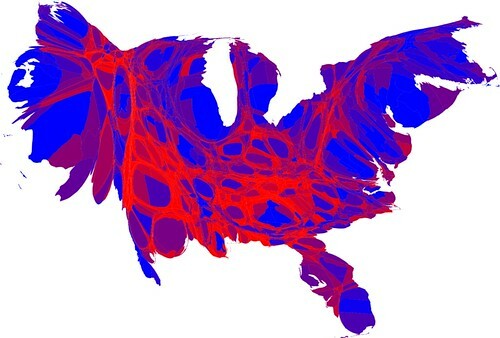 However, other data sets may be presented differently – such as, a distorted map highlighting variations across the country, like the one produced by Payton Chung. Content users expect to see traditional geospatial maps used in data visualization; don’t feel obliged to provide this. Consider the most effective way in which to present the data at hand and use this to engage with the viewer. It is not so much that interactive visualizations have replaced traditional forms; more that they have joined them on the front-line of data presentation, fighting side-by-side in an effort to give content users, customers, investors, or anyone else, the data they need to see. The fact is, in many cases a trusty infographic will give your content the punch it needs; delivering the right data directly to the user. Infographics and similar presentations are here to stay. However, do not turn your back on interactivity. When exploring broader concepts, the increased scope offered by interactivity enables users to drill down into the information and to really develop a keen insight in the topic at hand. Some of the most fascinating, the most rewarding, and the most delightful data visualizations of recent years have been visualizations that truly get the most out of the technology afforded to modern content producers. For your flagship pieces – for exploring ideas which really bear the weight of additional scrutiny – this is the format to use; a richly interactive journey through the different levels of data on offer. Allow content users to explore and to uncover the narrative laid out for them. And, of course, don’t ring the funeral bell for more traditional, 2D visualizations just yet either! The best narratives are all about connections. These connections take our minds to places we hadn’t previously considered, helping us to see the data presented to us in a wholly different light, and adding a whole extra level of insight which we can then harvest. We have already partly explored connections. After all, a progression along a timeline is an implied connection; these timelines show us that conditions must first be met before progress can be achieved, forging the sense of connection and causality in the brain. However, such a presentation is not suitable for all data sets. Another way to present connected data is via a hierarchical data tree, similar to the taxonomy diagrams you may remember from high school biology. This technique is useful for plotting data sets against one another, and then going into more detail, examining the different components which make up each set. Again, this method is not suitable for all data. A third way to establish connections within a visualization is to use a node diagram. If used properly, this method is very effective in describing connections to the user when at first they might not be instantly obvious. Different sized nodes imply different quantities of data, while the connecting arms show which sets of data are linked. Of course, we should exercise a bit of care and responsibility when utilizing these connections. With data visualization, there is a narrative to be presented. We can lead the content user so that they see this particular narrative, but we cannot manipulate data; we cannot forge connections which are not there. When implying causality and connections between sets of data, we must first confirm that such links exist. Data visualization is not data invention, and this is something that I will be exploring in more detail with a future article. In the mean time, make sure to use these techniques within your data strategies.